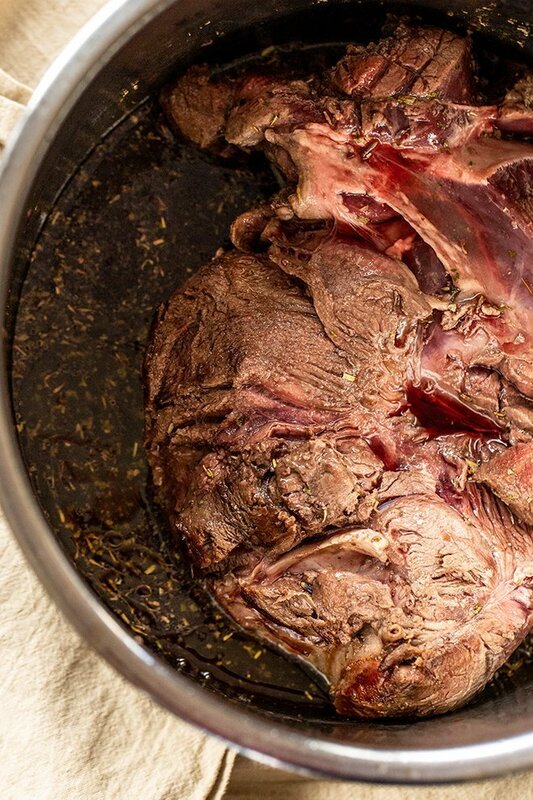 Venison roast gets fall-apart tender in the Instant Pot braised with red wine. Get that cooked all day long taste and a full meal quickly and easily. 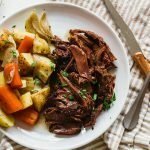 So, you guys went BONKERS for my Instant Pot Venison Stew which was the inspiration for this Instant Pot Red Wine Venison Roast. And, I mean, for good reason because it’s tah-die-foorhh, honey. It’s the most popular recipe on the site by a landslide now. It even beat out the forever favorite Roasted Bone-In Chicken Thighs this winter. Anywho, I begged Jared to get us some roasts this November when he harvested his Ohio buck. We just moved into our first home, so up until now, we’ve been relying on butchers to process our deer for us after J quarters them in the field. Processing a deer isn’t really too possible in a second story apartment, lol. 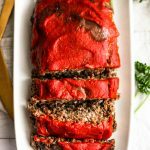 Back to the Instant Pot Red Wine Venison Roast. My stew recipe taught me that the Instant Pot is a one way ticket to tender venison town. It creates fall apart meat like no other. What I do to make this happen with a roast, is start by searing it as hard as I can on the saute cycle for 10 minutes. Then I add my braising liquid which is a good bit of red wine (the alcohol cooks out) some balsamic, and herbs d’Provence with a healthy amount of salt and pepper. The braising liquid combined with the pressure cooking powers of the IP are the magic here. The trick is to cook the meat on its own for an hour. You then release the pressure, add the veggies and cook for 10 more minutes. That’s how you get fall-apart meat and not soggy veggies, friends. 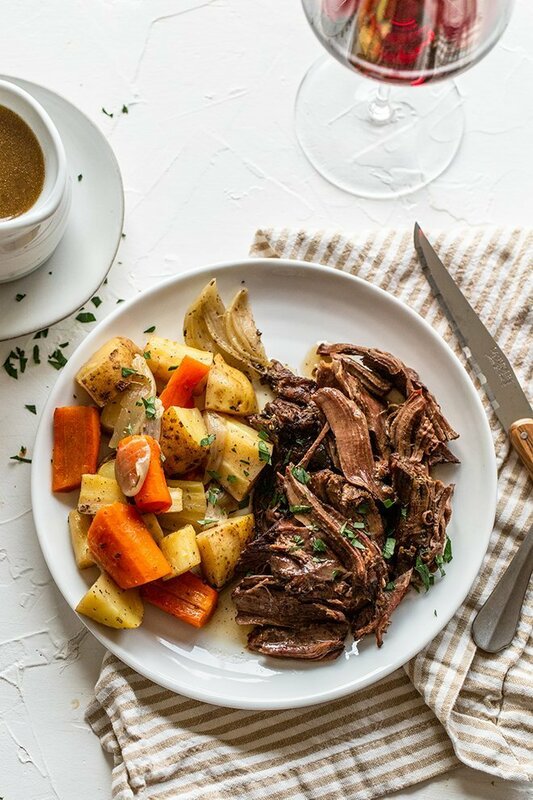 You’re going to LOVE this Instant Pot Red Wine Venison Roast. Stick with me, kid. I’ll learn ya (J says this to me ALL the time, haha). If you love this recipe, you’ll LOVE my Instant Pot Venison Shepherd’s Pie, too! Sick of Dry, Gamey Venison? 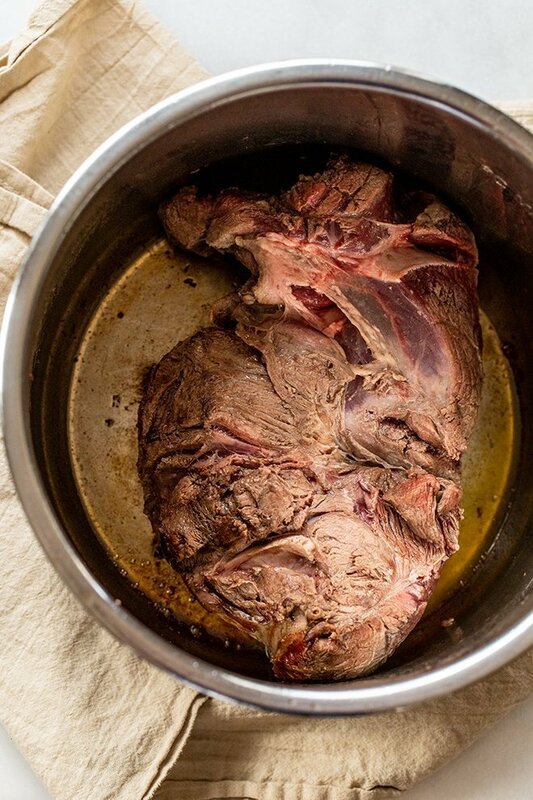 Download my FREE Top 5 Venison Cooking Tips + 2 Bonus Recipes to cook meals you love and save on your grocery bill by using the deer meat in your freezer. Turn the Instant Pot to “Saute” for 10 minutes. After about 3 minutes, when it is hot, add the oil and then the venison roast. Sear both sides of the meat until browned. When the “Saute” cycle has finished, add the red wine, balsamic vinegar, herbs d’ Provence, salt and pepper. Place the lid on the Instant Pot. Make sure the knob is set to “Sealing”. Set the Instant Pot to “Pressure Cook” or “Manual” on “High Pressure” for 60 minutes. 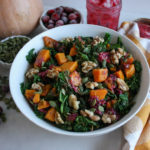 Allow the course to run and allow the Instant Pot to naturally release for 10 minutes then carefully perform a manual release. 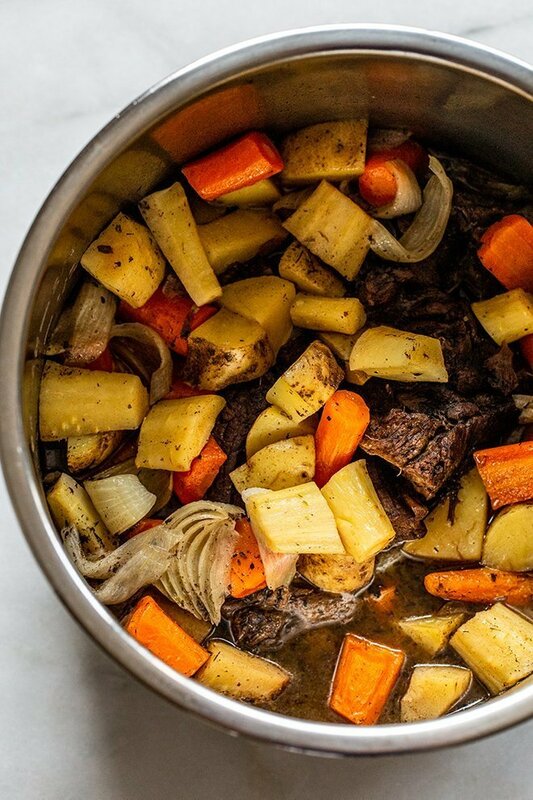 Add the onion, carrots, parsnips, and potatoes to the Instant Pot on top of the venison. Toss everything around as best as you can to get some of the liquid on top of the vegetables, but don’t worry if they’re not covered. Return the lid to the Instant Pot and turn the knob to “Sealing”. Set it to “Pressure Cook” or “Manual” for 10 minutes on High Pressure. Allow the cycle to run and immediately perform a manual release. Remove the vegetables and the venison from the pot. Simply shred the roast into chunks to serve. To make gravy, strain all of the pot juices into a medium saucepot. Whisk in the arrowroot powder. Cook for 5-10 minutes over medium heat until desired thickness is reached. Taste before serving to test seasoning level and stir in salt and pepper if desired. beef roast would work well, too! 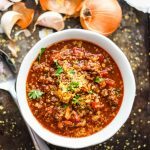 If you want to make this in the slow cooker, saute the venison in a pan and add it to the slow cooker with all of the other ingredients. Let it cook for 4-5 hours on high or 8 hours on low. herbs de Provence is a French spice blend. It’s lovely and Wal Mart actually has a great organic variety for under $3. If you have to substitute, use Italian seasoning. If you don’t want to use red wine, beef stock could be used to substitute, however, I have not tested that method. Post contains affiliate links. If you choose to purchase through one of the links, I receive a small commission but your price remains the same. 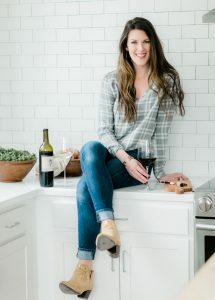 Is there something I can use instead of the wine? We don’t drink alcohol but I don’t want to lose flavor or the roast to dry out! Hi Lauren! You could try beef stock! It won’t have the same flavor but that is what I would try! I’m so glad! Let me know what you think!